Apologies for shielding this essay from the less intelligent among our fellow Ephs. Real truth is too upsetting for them! [A] few fundamental problems with professional baseball’s umpiring system should be fixed. Major League Baseball does not train its own umpires, and therefore it has not established practices that would attract the best people. Those who wish to enter the profession attend schools run by former umpires. But these are entirely private businesses; the commissioner of baseball doesn’t control the curriculum, manage the training or do anything to lure people of all races and ethnic groups to become umpires. What does race or ethnicity have to do with being an umpire? 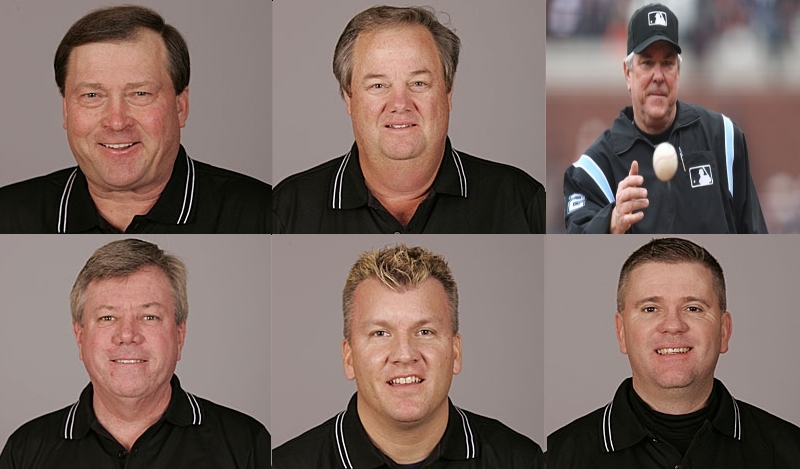 Let’s go to the photographic evidence and check out the 6 umpires selected by Major League Baseball (MLB) to work the National League Championship Series this October. What do these men have in common? As far as Fay Vincent is concerned, they are too white. Think this is an usual result? Here are the six umpires selected for the World Series, featuring Professor Sam Crane’s beloved Yankees. Though no one will admit it, or at least volunteer it, the other factor that enters into the selection of World Series umpires is diversity. The ethnic imbalance in the major league umpiring corps is, well, shameful, and in recent seasons it has clearly become important to the commissioners office to counteract the impression that baseball has been lax in dealing with it. Anyone know why that was not true this year? My guess would be that the umpires union prevented Major League Baseball from instituting the sort of diversity that it [MLB] would prefer at the World Series. Strong unions do an excellent job (as the recent Supreme Court case involving fire fighter (and union member) Frank Ricci demonstrated) at protecting their (usually white) members from the diversity demands of their employers. But the vagaries of the World Series aside, the real question is: Why does Fay Vincent think that the racial composition of the baseball umpire corps is a problem that needs to be “fixed?” Why does Vincent care about the race of the next triple AAA umpire to be promoted to the big leagues? Shouldn’t the primary consideration be the skill of the umpires under consideration? Professional baseball isn’t exactly color-blind when it comes to umpires; only six African-Americans have been on the major league umpire roster in the history of the big leagues, the first not until 1966, nineteen years after Jackie Robinson was a rookie with the Brooklyn Dodgers. So it was noticeable to me that Ben [an African-American umpire] never mentioned being black during our time together in Boise; at one point I asked him if he thought it affected the way people saw him on the field and he shrugged. Nah, he said. A few months later, after his first season, I asked him again, and he told me that he didn’t feel that being black had any bearing on his umpire experience at all, that the only racial comment he’d heard on the field came from a black coach, who during an argument had called him “bro.” That bothered him, he said, the presumption that they had a bond. My impression is that Ben isn’t unique in that way. I’ll have more to say about the dearth of black umpires in baseball a bit later on, but the black umpires I met in both the major and the minor leagues were uniformly unwilling to accuse the game of institutional racism. Perhaps a racism/no-racism binary choice ignores the subtitles of race in America today. It could be, for example, that white minor league managers/players are more likely to argue obstreperously with non-white minor league umpires. This excessive argumentation makes the umpires look bad to the non-racist Major League officials evaluating them. In that case, the rating process is non-racist, but the underlying racism of American society, as exhibited by the tendency of white players/managers to argue differently depending on the race of the umpire, causes non-white umpires to be evaluated less highly than they would be if American society were not racist. For example, perhaps more Hispanic umpires (at least Spanish-speaking ones) would be able to communicate more effectively with players/managers whose first (or only) language is Spanish. An umpire crew that included at least one African-American might be better able than an all white crew to decrease tension in a inter-racial dispute following a hit batter. (Recall our discussion 5 years ago about the argument between former baseball coach Dave Barnard and VISTA.) So, one could ague, and perhaps Vincent believes, that reserving, say, 8 of the next 10 Major League umpire openings for non-whites is a good idea, even if those umpires are somewhat less talented than the white umpires who would have gotten the job under the current process. Such a guidelines might lead to better performance for baseball umpires as a whole. It might also lead to more productive/enjoyable work for the white umpires who maintain their jobs. This is exactly the argument that is (reasonably!) made for affirmative action at Williams. Admitting less qualified blacks/Hispanics improves the educational experience for everyone. Perhaps the same is true for umpires in baseball. The one group made clearly worse off are the white umpires left in the minor leagues who would have been elevated otherwise, just as the most important victims of affirmative action at Williams are the white and Asian-American applicants who would have gotten accepted in a race blind system but who are rejected today. Fortunately for those in favor of affirmative action in umpiring or admissions, both groups of victims are essentially invisible. But the really interesting aspect of this dispute is not what Vincent and his supporters say, nor is it the arguments that we might offer in support of their position. The interesting aspect is what they don’t say. Vincent is concerned that not enough non-whites are umpires. But does his concern extend to other job categories besides umpires and other racial groups besides blacks/Hispanics? Here are the 11 starting defensive players (as of October) on the New York Jets. 17 of the 18 umpires in the League Championship Series and World Series were white. For Fay Vincent and his supporters, this is a sign that we need to “fix” the process by which umpires are trained and selected. 10 of the 11 starting defensive players on the Jets are black. For Fay Vincent and his supporters, this fact is an irrelevant aside at best and a racist observation at worst. There is no evidence here that we need to “fix” the process by which football players are trained and selected. Can you imagine Vincent (or any faculty member at Williams) writing an op-ed for the New York Times entitled “Building a Better Cornerback” and including this passage? [A] few fundamental problems with professional football’s player development system should be fixed. The National Football League does not train its own players, and therefore it has not established practices that would attract the best people. Those who wish to enter the profession attend colleges run by former players. But these are entirely independent organizations; the commissioner of football doesn’t control the curriculum, manage the training or do anything to lure people of all races and ethnic groups to become football players. Of course not! Although we have had some frank discussions at EphBlog in the past about the racial distribution of NFL players (here and here), any such comment made in polite Williams company would be viewed as kooky, if not dangerous, racism. The notion that the NFL, or anyone else, should worry that whites are dramatically under-represented in professional football (and the situation is even worse for Chinese/Japanese/Korean-Americans) is, almost, unthinkable. And yet the situations are directly analogous. Observing that the racial/ethnic/gender composition of various categories (Major League umpires, professional football players, Williams College students) does not match the population distribution of America (or whatever relevant target population you select) is a matter of stating the truth. Once we have observed this truth, we can explore its ramifications, we can try to understand its causes, we can consider policies for changing these outcomes. Maybe the world would be a better place with more black umpires and more white cornerbacks. Maybe it would not. Maybe there is nothing we can (reasonably) do to achieve those goals. Maybe we should not even try. But until people like Fay Vincent stop focusing on only those cases in which whites are (allegedly) overrepresented it will be hard to be sure that they are approaching the topic with an open mind. Among the potential bombshells in the book are data on the advantages or disadvantages of SAT or ACT scores by race, ethnicity and economic class. Many studies — including those released annually by the College Board and the ACT — show gaps in the average tests scores by members of different racial or ethnic groups. This research takes that further, however, by controlling for numerous factors, including gender, status as an athlete or alumni child, high school grades and test scores, type of high school attended and so forth. The “advantage” referred to, to take an example from the book, is what it would take to have equivalent odds of admission, after controlling for other factors. So the table’s figure of a 3.8 black ACT “advantage” means that a black student with an ACT score of 27 would have the same chances of admission at the institutions in the study as a white student with a score of 30.8. As the following table shows, there are large black advantages in the way colleges consider SAT and ACT scores, and notable disadvantages for Asian applicants. On issues of wealth, the SAT shows an expected affirmative action tilt, with the most disadvantaged students gaining and the wealthiest losing. But there is also a gain for upper middle class students. On the ACT, analysis found the advantages go to wealthier students. The table uses ACT scores for public institutions and SAT scores for privates. The “norm” score was considered white for the race section, and middle class for the class section. Much of the debate about affirmative action historically has focused on the advantages given to those from some minority groups. But the research in No Longer Separate, Not Yet Equal may also be of particular interest to advocates for Asian students. Many such advocates and guidance counselors who serve those students have charged in recent years that elite colleges have de facto higher standards for Asian applicants. Is the Asian disadvantage of 3.4 points on the ACT and 140 points on the SAT evidence to bolster that claim? Read the rest of the article (and the book) for more details. One might quibble with the exact regression model (I would prefer to use matching) or with the data sample — I don’t know if Williams is included and I suspect that the inclusion of at least one large California school skews the results a bit in terms of the Asian disadvantage. But, big picture, there can be no doubt that African-American students at places like Williams have dramatically lower academic qualifications (test scores, high school grades, et cetera) than Asian-American students, even if you “adjust” for things like high school quality. “I understand the worry of Asian students, but do I have a smoking gun? No,” he [Espenshade] said. Imagine that, instead of college admissions, this were a study about selection for major league umpire and that it turned out that white applicants had significantly lower qualifications (percentage of correct calls as determined by video replay; ratings by expert umpires) than non-white umpires. You can be certain that Fay Vincent would cite such evidence as a smoking gun which would confirm that the racial disparity in major league umpires is at least partially caused by inequities in the system of umpire promotion and that, therefore, something ought to be done to correct this obvious injustice. And he would be right! If I were an Asian-American applying to Williams (as my daughters will probably be doing in a few years), I would want to understand just what is going on with elite college admissions. What is the truth of social science when it comes to the process by which some people succeed in becoming baseball umpires or football cornerbacks or Williams College students? A good question. Is Williams the sort of place at which we can have an open and honest discussion on this topic? I don’t know. But perhaps a student group like Phi Beta Kappa would be willing to invite me and a member of the Williams faculty to debate the topic over Winter Study. In the meantime, your homework assignment in the spirit of uncomfortable learning is to think hard about just what causes these racial disparities. Why is it that whites are overrepresented among baseball umpires, blacks among NFL players and Asian-Americans among elite college students? The three most common explanations for any sort of group disparity are nurture (no Brazilians in the NHL because no one grows up playing ice hockey in Brazil), nature (no Pygmies in the NBA because genetically determined height is such a crucial component of success in basketball) and society (no African-American players in Major League Baseball before Jackie Robinson because it was against the rules). What role, if any, do each of these factors play in the racial disparities we see among umpires, football players and Williams students? The Williams College of 25 years ago was not ready to have that conversation. What about the Williams of today? [edited to desnark by author] votes post down vigorous for bad timing and bad baiting. You make some interesting points, but I’m not sure if I agree with your conflating umpiring, NFL player selection, and higher education admissions. I think what you’re struggling with here is the notion of “meritocracy.” In sports, we’re comfortable with the sense that the best players should be professional atheletes (the race to the swift, etc.). (Though, for the Olympics, the advertising often focuses on human interest). Although education is also, partially, a meritocracy, access to education is also considered a social good, and a mediator of access to wealth, success, social status, etc. For that reason, the comparison is apples and oranges. For a unionized workforce like umpires or NFL referees, there’s no reason that workforce couldn’t (or shouldn’t) look more like the players, or the nation. That doesn’t interfere with the essential mission – calling games, fairly. (If you recall, the comparison of NFL playoff ref selection to MLB playoff ref selection hinges on how to identify best reps and optimize their selection for key games). However, for college, we’re not comfortable with an umediated meritocracy, not least because there is discomfort with selection mechanisms. I’m not sure if that’s unfair, or just a recognition that there is more at stake than with sports. David, how much time did you expend in pulling this post together? Rory: What aspect of the “timing” of this post do you object to? I understand the baiting complaint but not the timing one. Frank: The post itself only took a few hours. I am getting fairly good at manipulating pictures within Paint.net, which I highly recommend for this sort of stuff: free and useful. I have been thinking about related topics for over 25 years, first discussed in an Eph context during a Winter Study seminar my freshmen year. The consensus in the class was that I and another athlete (who thought that blacks dominated cornerback for a reason) were either clueless or racist. Aidan: Your point on the “meritocracy” point is well-taken. Most people certainly think about the selection process for umpires, NFL players and Williams students as being very different, and those differences being a good thing. But I still think that this is an apples-to-apples comparison because of the overrepresentation of specific racial groups in each context. Whites are overrepresented among umpires. Blacks are overrepresented among NFL players. Asians are overrepresented among Williams students. Now, personally, I have no problem with any of these results. I don’t think that the processes which create these results are biased, in any meaningful way, againt non-whites, non-blacks or non-Asians, in each context. But to the extent that Fay Vincent wants to “lure people of all races and ethnic groups to become umpires” (which is, obviously, code for “we need fewer non-Hispanic whites”), it is interesting to note that he (and most other Ephs like him) never express a similar opinion when it comes to categories in which whites are underrepresented. I stopped reading halfway through. Everyone knows baseball, for the first time in a long while, intervened and denied the umpire’s union allotment of World Series umpires. The ALDS, ALCS, and NLCS were so riddled with problems that MLB scrapped their earlier plans for who would umpire the World Series. Ugh, I can’t believe I am even responding to this. Fay Vincent publishes a very thoughtful critique of the MLB umpire-training process and it turns into this disaster of a post. Not only is your first assumption wrong. But it was the MLB Umpire union that has led to inadequate postseason selections. There has long been a culture of “you’ll get your turn if you’re here long enough.” Your union argument, along with the rest of this post, is fatally flawed at the outset. Agree with Neal here – the issue is not the composition of the umpires per se, its the identification and selection of excellent umpires for high visibility playoff games. After having issues with this, MLB changed the selection criteria to deliver a more satisfying work product. Humility is completely lost on you, isn’t it? Is this preface even necessary for your point, or are you just trying to challenge yourself by making your audience resent your conceit before you even start arguing? You dodos, David is merely attempting to tease a greater audience into reading his philipic. I thought the first 12 photos were the finalists for the Williams presidential search. In a game where teams with $201 million dollar annual payrolls stacked with drug abusers “compete” against teams with $40 million dollar payrolls populated by kids playing it straight I would not care if all the umps were pre-schoolers or chimps. Maybe it’s a conspiracy, everyone hates the umps and they are all white. Downright Pavlovian. I value your opinion. Could you provide some feedback on how this post (which I consider to be some of my best work) could have been less yawn-inducing? 1) I think that the major topics (Fay Vincent’s ’60 views on diversifying the umpire corps and Espenshade’s research on elite college admissions) are perfect for EphBlog. Agreed? 2) Perhaps I should have cut out all the football stuff? I wanted to provide three examples and show the parallels between them and football seemed a good choice. Was it boring? Might I have selected a better example? 3) Should I have cut all the stuff concerning hypothetical mechanisms by which racism could affect the process by which umpires are trained/promoted? I don’t find these arguments compelling, but I wanted to present the best possible arguments from the “other side.” Would you recommend deleting those sections? As always, I do not want to bore my readers, especially the most intelligent and open-minded among them. What should I do differently next time? I think this is probably your worst post of the year, for about ten different reasons. Unfortunately, because of the Catch-22 you’ve set up (finding this post problematic in any way just confirms that Ephblog readers don’t want to face hard truths! ), you’ve ensured that any critique just strengthens your point further, and betrays the hollowness in your call for truly open discourse. I am someone who is most definitely equivocal about race-conscious policies like affirmative action, but nothing in your post is remotely persuasive or novel in the manner you seem to think. In fact, I feel confident that I’ve read in the past few years about ten arguments between you and others (mainly Rory) on exactly these same points; the ground has been well-trodden here. Perhaps that is the reason for the yawn from Ken. We all know where you stand. Yet you put this out like you breaking some novel ground here, or uncovering some massive conspiracy for the first time. I really don’t think anything you are reporting is remotely newsworthy to a single semi-regular Ephblog reader. I will just make one substantive point — any football fan with two good eyes can quickly tell which players are performing well, and which aren’t. I knew from the first full game they played that Hakeem Nicks would eventually be a top-notch receiver, and that CC Brown can’t cover a corpse downfield (I am a Giants, not a Jets, fan). This is not remotely comparable to assessing performance in almost any other arena, where those assessments are far, far, far more subjective, and racial bias without any doubt actually does a play a role. I can’t name one NFL official, for example, nor do I have any idea how good any of them are. I’m not going to repeat the zillion well-documented studies that Rory has referenced in the past about, for example, how guys with black-sounding names fare in the job market, all other factors being equal, or about how race-based expectations become self-fulfilling prophesies. Racial bias against minorities in job situations that require any sort of subjective assessment is as much a fact of life as slow white cornerbacks, yet you act as if only the latter exists. Please. Look at professional coaches. How many high-level black coaches who foul up once ever get a second chance as a head coach? very, very few. Meanwhile, the likes of Mike Dunleavy in the NBA get a zillion chances to screw up again, and again, and again. If you are a white coach, there is a different comfort level from management, and somehow, they get more opportunities, as all kinds of excuses and rationalizations can explain a coaching record even as horrific as Dunleavy’s. But if someone can’t shoot a basketball or can’t guard worth a lick, then they are done-for, no matter what their race. The two situations are not remotely comparable (I use coaching since I know very little about baseball umpiring and don’t care to educate myself). Oh, and your first and last paragraphs are just flat out idiotic. And given that I well exceed your standardized testing threshhold, I must be qualified to judge. Making a little bit of fun of you. Your post was long. I’m all for exploratory writing (and tolerance of it, without mocking!) but… to be an effective vehicle, this post could use road markers, summary information, and/or bits of plot and excitement along the way to keep the reader interested and motivated. And– what is the significance of this tale? I dropped out before hearing that; I didn’t hear it soon enough. You also present information that is– to me at least– generally fairly obvious (so my ‘yawn’ had more than one meaning or “reading”). I think some of the frustration here (not just mine, but the audience’s)– in addressing your subjects, you seem to tend to hedge, or couch, or hide, major and possibly controversial premises in more than odd ways (such as your metaphorical intro about SAT scores and who can comprehend this post). Allow me to say that these are not always as effective as they could be, and from a reader-response perspective, often counterproductive. The bottom line is that we should see starkly noticeable racial divides in comprehension/capacity given the current regime of things. There is nothing odd about this; I knew juniors in Physics at Western Kentucky University struggling through concepts that were “first semester” and considered relative simple at Williams. We (community) will differ about the reasons, causes, significances, and import of the racial/capacity/scores tale you chart — we (you and I) probably also differ quite markedly in the significance of “innate characteristics” and “race”– and you seem to be hedging (or hiding) claims with regards to the significance of racial/genetic components in this tale. My gripe with the general topical area (which extends to the topics of your writings on several issues) is that there is little substantive discussion of these issues, rather ideological or religious reinforcement of the order of things. To turn to Will’s post– to say something I don’t want to say inside of his post (at the moment)– disrespect and “insensitivity” to the QSU?– please! Isn’t that a little much (even though I disagree with you, and might choose doors 1 or 3, or the trapdoor?) At some point, the boys and girls in the QSU need to be told– need to hear– that their claims are a bit ridiculous and undercut their legitimacy. (If you read the alum list, you’ll see this said and repeated in other ways; I’m not saying anything beyond the par; reality concerns do exist!). What do we make of the situation of a junior at WKU (who will likely take six to eight years for undergrad) struggling through exercises whose subject matter one passes over in a week or two in Physics at Williams? We can do better– we can teach that person better– but we also have to ask, what’s the point of putting them through the exercises? As presented, you seem to make conclusions from the data, which are likely not warranted; or at least, you seem to be at the same time overplaying, and not exploring, the significance of having a part of the student body with significantly lower qualifications, than the median and the other end of the curve?. One could also look for other data points and ask other questions– what’s the SAT to GRE gain in various populations/groups, from four years at Williams, if we begin to look closely? (Regardless: perhaps you are just presenting the conundrum). Nonetheless– since I’ve had similar conversations in the MCC, and with various alums, many times– what is inane, is acting like there is a level playing field here, and that students at Williams (etc) have roughly equal preparations and will respond to the same methods. but most of your audience in likely hostile to your general project, on the one hand (and for various reasons); and on the other, a reader has to dig fairly deeply to attempt to tease out the contours of your larger project (is the core here that you’re arguing that there is a structural parallelism between college admissions and umping, for instance)? And so on. You (on quick glance) seem to argue that there is nothing wrong with the racial status quo in umping– or that it reflects natural processes. You have a very rough edge when you place cornerbacks next to umpires, and argue parallel causes for racial differentiation. You do not address what social structures lead to the racial differences, and what fiddling with this may mean (except by implication, in your title); and you make very broad, over-reaching, poorly defined and substantiated claims (“there is zero evidence of any racial bias in umpire selection today”). Geez. A scatter plot of Irish and Italian ethnicities, by profession, might tell a different story– but we also need to make some distinctions between racial bias and racial differentiation. All of this is to say you have what might be a compelling post, but you’re fighting an uphill battle, and to me, as things are presented, haven’t raised the necessary questions to draw my attention. (Noted that I have little innate interest in umping in US baseball). A large part of your audience is (of course) knee-jerk Williams liberals who assume that any criticism of the QSU or racial diversity schemes (“seriously”: my mail notification has just shown me the first line of JeffZ’s reply) means that you are evil (I just thought: “an evil Jew”), a racist pig, etc. ; and therefore will immediately dismiss or argue against anything you have to say, for this reason. (It’s up to you to decide whether one can have a discussion with the self-righteous). Not to say that JeffZ fully meets the glib negative stereotype I employ above. By the time you get to your request that we think “hard”– well, if anyone got that far– maybe you should have started with a description of the conundrum, then that entreaty– then you move back to reductionist categories of “the three most common explanations” and boxing people into “what role, if any, do each of these…” You’re missing the forest for a few trees, and frustrating any reader by focusing on explanations that don’t really fit the examples. Ken, I’ve explained some of my reasons to DK both on Ephblog and off, but none of them equate to a belief on my part that he is racist, etc. I think he enjoys being provocative above all else, and I think he likes to bait with needlessly antogonist challenges, but I don’t think he is a racist, or homophobe, or anything like that. I appreciate this comment. Thanks for taking the time to write it. I would love to hear from other readers as well. 1) The main “novel ground” that I seek to cover is Vincent’s views on umpire diversity and Espenshade’s research on elite admissions. I don’t think that we have discussed either before. Espenshade’s book is certainly the most important academic work on elite admissions in the last year, if not the last decade. any football fan with two good eyes can quickly tell which players are performing well, and which aren’t. This is not remotely comparable to assessing performance in almost any other arena, where those assessments are far, far, far more subjective, and racial bias without any doubt actually does a play a role. Assume that the process by which football players are selected/promoted is perfectly color blind. (I actually think that this is as true in football as in almost any other area.) The interesting thing, then, is that we would then have a concrete example of an important field of human endeavor in which one racial group is dramatically over-represented. Does that suggest that the same might be true in other areas as well? That is, once we accept that racial disparities are possible in area X (even with perfect fairness and color-blindedness), we can hardly be surprised to see similar racial disparities in area Y. Would you agree that the football player process and the elite college admissions process (without admissions preferences) are equally objective and fair? (a) the goals for “performance” with selecting football players are far clearer and more concrete than the goals with college admissions. With football, you want to win games. That is it, finito, end of story. There are many different goals related to college admissions: identifying talented scholars, identifying the right fit, creating a campus with an interesting and fruitful mix of students, finding people who will contribute to campus life in a variety of ways, providing opportunities for those whose talents may not have been recognized in traditional ways, I mean, the two scenarios are not remotely comparable. (b) the measuring tools available are, once again, far more concrete and predictive in terms of football. 40 time is 40 time, college stats are college stats, height and weight are height and weight. Comparing students who have had vastly different opportunities, faced vastly different challenges, etc. etc. is again not remotely comparable. Even the single most objective measure, the SAT, is highly problematic in a way that a 40 time is not — studies on underperformance due to self-perception issues are abundant, not to mention private tutoring opportunities and the like. In some ways, I think the system now is TOO reliant on objective factors. I wouldn’t mind seeing Williams going back to the old “ten percent” model, maybe reduced to five percent, but I think the college admissions model in many ways encourages conformity and discourages risk-taking and alternative paths for people who have a tremendous amount to offer. I’ll grant that if your only concern is finding the students who will earn the highest GPA’s, the SAT may be as useful as football metrics. But that is far from the only concern (or even the paramount one) college admissions offices should have. 1) I stand (sort of) corrected on whether or not we had “discussed” Vincent’s views on umpire diversity. (I had forgotten those two comments of mine on Jr. Mom’s post.) But 99% of that thread was devoted to issues surrounding the players union. Did we ever discuss diversity? Not that I can see. 2) Do you really think that “lies” is the best language here? By “Espenshade’s research on elite admissions” I was referring to the book and article I quoted from in the post. Now, to be super-duper-extra-crystal-clear, perhaps I should have written “Espenshade’s just-published book on elite admissions” but surely my meaning is obvious? What possible reason do I have for lying about whether or not we have discussed Espenshade in the past? @David: lies part two: you commented 11 times on that vincent thread. and you made it about the union. you have yourself to blame for that. and as a researcher, you should know that the article 99% of the time has 99% of the important information (often even has better info) than the book version. cmon. you begin a post with “Needless to say, that doesn’t mean you are a bad person or any less an Eph than I am, but there are certain essays that will be difficult for you to understand. This is one of them.” not funny. bad timing. bad bait. bad (and tired and rehashed and you *still* haven’t bothered reading a single thing i’ve pointed you towards, so forget it, i’m not engaging except to explain to people why i’m not engaging) post. doubling down isn’t doing yourself favors. and your description of football selection and sorting is focused far too much at the top of the pyramid (from college -> pro) and not where the large majority of sorting is done. Hell, even espn recently on Outside the Lines had a better view on sports and racial bias against the white athlete than you’ve presented (and it still wasn’t particularly well done). I’ll grant that if your only concern is finding the students who will earn the highest GPA’s, the SAT may be as useful as football metrics. Iterating to agreement once again! 1) I might quibble with a lot of your specifics above. A 40 yard dash time is a useful metric, obviously, but running without pads, in a straight line, with nothing else going on is, obviously, not perfectly correlated with speed in an actual game, just as the SAT is not perfectly correlated with academic success. I would also note that there are private tutors for things like the NFL combine just as their are tutors for the SAT. 2) Similarly, my goal is not to argue about what the goals of college admissions should be. The goals are whatever they are! Or whatever you want them to be. The only point I am making is that we see significant overrepresentation of Asian-Americans at Calteach just like we see significant overrepresentation of African-Americans on the Jets. The issue is: Racial disparities can (often do?) exist within institutions/processes that are as fair and non-racist as we can make them. But back to our agreement. I think that using Caltech as an example is useful because it, by design, does not practice (meaningful amounts of) admissions preferences. Being an athlete or a legacy or a urm does not help you. The (only) goal is academic excellence just like the (only) goal for the Jets is winning football games. Asian-Americans are present at, about 8 times, their rate in the US population. This is, depending on how you look at it, similar to the overrepresentation of African-Americans in the NFL. Summary: The analogy I want to draw here is between three categories: MLB umpires, NFL players and Caltech students. In all three categories, at least one racial groups (whites, blacks, Asians) is significantly overrepresented. In at least two of these (NFL and Caltech) the process uses for selection is as fair and race-neutral as we can make it. In other words, even if you hid the race of the applicants, the NFL and Caltech would pick, more or less, the same people it does now. And this is a good and wonderful thing. I believe that the same is true for MLB umpires. Hell, even espn recently on Outside the Lines had a better view on sports and racial bias against the white athlete than you’ve presented (and it still wasn’t particularly well done). Clearly, I have failed completely to get my point across. Let me put it in bold: I do not believe that white prospective football players are discriminated against. I think that the football selection/training/promotion process is almost completely color-blind. My point is using football is not to claim that whites are discriminated against. They aren’t! My point is that, even in a fair process, it is possible (likely!) that racial groups will have different levels of success and that, therefore, disparate outcomes are not always a sign of racism. In exactly parallel fashion: I do not believe that white prospective Caltech students are discriminated against. I think that the Caltech admissions process is almost completely color-blind. And, you can probably guess my next claim: I do not believe that non-white prospective MLB umpires are discriminated against. I think that the umpire training/promotion process is almost completely color-blind. My point with regard to Vincent is that he seems very concerned about the racial distribution of umpires. But people like him are never concerned about the racial distribution of football players or the racial distribution of Caltech students (except for demands for more blacks/Hispanics). Apologies for not being clear about that. But David, the point is not necessarily conscious discrimination. If you read Sam Sommers’ blog or any other psychologist who studies race and hiring, you know that there are just a huge body of studies that show that people without even realize it make assumptions based on race (usually to the detriment of black applicants) and discriminate in the hiring process. The more subjective a hiring process is, the more likely there is to be such discimination involved, and the more organizations need to be conscious to take measures to counteract that. Since the NFL selection and retention process is the LEAST subjective I can think of (short of a truly blind audition process for an orchestra — which, by the way, yields very different results from a non-blind process), that is why your comparison is of little use — the NFL has probably the MOST fair outcomes of any hiring process you could select. Now, could a truly fair, unbiased, color-blind hiring process yield racially non-proportionate results? Of course. But you are conflating THAT argument with an entirely different argument that MLB’s current system is currently free of bias and there can be other explanation for the lack of black umps other than blacks simply aren’t good at umping. And you certainly don’t have remotely close to the level of knowledge of umpire selection required to make any such statement with any degree of confidence. @David: you’ve misread me yet again. @rory: you’re clearly just not smart enough to understand. I don’t think you read the disclaimer. If you read Sam Sommers’ blog or any other psychologist who studies race and hiring, you know that there are just a huge body of studies that show that people without even realize it make assumptions based on race (usually to the detriment of black applicants) and discriminate in the hiring process. Agreed. But we need to be careful in invoking discrimination as a deus ex prejudico which magically explains an difference in racial achievement. Let’s focus on the case of Caltech. Aren’t there a “huge body of studies that show that people without even realize it make assumptions based on race?” Of course there is! Aren’t a big part of Caltech admissions driven by people — both high school teachers grading/recommending students and admissions officers evaluating them? Of course they are! Now, imagine that I cited the (true) fact that whites are significantly underrepresented at Caltech. Imagine that I claimed that this was evidence of racism on the part of high school teachers and/or Caltech admissions officers. You would (rightly!) claim that this was probably nonsense, that there was no particular reason to think that racism plays a part in white underrepresentation and/or Asian overrepresentation, that, to make this case, I ought to rely on, not just generic studies about discrimination is somewhat contrived settings but on more direct observations/evidence concerning the admissions process itself. And you would be correct! (And the same argument would apply to those who think that discrimination plays a meaningful role in football.) 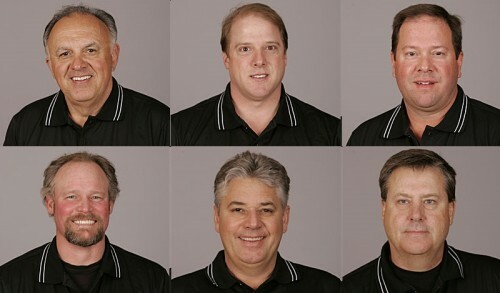 This is just what I propose as the first step in looking at umpires. And, to reiterate, although there are generic studies about discrimination, nothing I have read about the umpire hiring process (and Weber’s book is amazing) suggests that there is racism/discrimination involved, just as with Caltech. Of course, just because we don’t know of evidence for discrimination in the umpire or Caltech process does not mean that it is absent, but isn’t that assumption a good idea as a first approximation? The more subjective a hiring process is, the more likely there is to be such discrimination involved, and the more organizations need to be conscious to take measures to counteract that. Since the NFL selection and retention process is the LEAST subjective I can think of … that is why your comparison is of little use — the NFL has probably the MOST fair outcomes of any hiring process you could select. I agree. Again, my point about the NFL is just to reiterate (and I am glad that we agree on this) that a fair, non-racist process can lead to a wildly disproportionate racial distribution. I assume that you would grant the same with regard to other professional sports leagues as well: NBA, NHL, MLB and so on? Now, my next question (not just for Jeff but for anyone still reading), just how much less subjective do you think the Caltech admissions process is? I would argue that it is at least as non-subjective as NFL hiring. They have a clear measure of achievement (academic success), lots of relevant data (high school grades, test scores, et cetera) and lots of post selection data (getting to see how students actually perform). No system is perfect of course and just as NFL teams sometimes make lousy draft decisions (or at least decisions that turn out poorly), one would expect Caltech to make at least as many mistakes. Once we agree on how objective/fair/non-racist the Caltech/NFL processes are, we can try to figure out where the umpire process (and other mechanisms) fit in on the spectrum. With that knowledge, we could try to estimate how much of the racial imbalance is “fair” and how much is do to racism. No. A good first approximation might be the null hypothesis. When it comes to individual people, I think it is a good rule to assume the “innocent” (whatever that means in the context) hypothesis absent significant evidence to the contrary, but I see no reason to apply this rule to society as a whole, institutions, or anonymized masses. In fact, given the fact that there are divergent outcomes in situations where one would not expect there to be divergent outcomes in the absence of racial biases, it would behoove someone who is interested in the issue to try to investigate whether there is racial bias, or instead some other factors one has overlooked. EphBlog is powered by WordPress and delivered to you in 1.057 seconds using 41 queries..